I wanted to share some info about snorkeling for people with physical disabilities. I had a spinal cord injury a long time ago. So long ago, in fact, that I think I am one of the first 100 paraplegics on earth to qualify for a dive card. I absolutely love the water. I moved to Oahu just so I could spend more time in it. Well, also so I could play more Hawaiian music, but that is another topic all together. Here is how I get out of the wheelchair and into the ocean. Because I have developed my upper body strength, I am able to look around any beach, find two people with athletic bodies, and convince them to do a fireman's carry from where I leave my wheelchair to where I can start swimming. The reverse process is usually done with the help of my wife, who recruits two more volunteers to go down to the water and help me up the beach to my chair. A better method is to find a beach where I can check out a beach chair with huge inflated tires that lets my wife help me get down to the water in a less gymnastic way. Getting more of these sand vehicles available to the public is my current mission. I am working right now on getting one at the Surf Center in Haleiwa. For snorkeling, I used to use webbed neoprene gloves to help give me more power in the water. They interfered with using my hands to adjust my equipment, so now I use swimmers training paddles that hang off my wrists with a silicone rubber tubing when I want to use my fingers to fiddle with my mask or snorkel, or to grab my GoPro to film fish or my friends. I mostly use a breast stroke, for snorkeling above the reef, and for diving down below the surface to get a better look. If I really want to go fast, I use a freestyle or crawl stroke, but that uses up more energy. I also have developed a sculling motion, where I move the paddles gently back and forth next to my hips, kind of like a fish might use their side fins to cruise slowly around the reef. As you can probably tell by now, I am very much at home in the water, where gravity is not so much a problem as it is on land. If you want to know more about snorkeling for people with physical disabilities, comment on this story. My husband is paraplegic, T10; which snorkeling spot on Oahu would you recommend? After snorkeling several spots around the island, the best, most accessible spot has to be Haunama Bay. They have a wheelchair-accessible electric cart that runs rountrips from the visitors center to the beach, and when you get to the beach, there is a kiosk staffed by volunteers who will lend you a fat tire beach wheelchair you can use to get over the sand and into the water. They will store your wheelchair at the kiosk, which is in a paved, wheelchair accessible area near the restrooms and showers. The reason it is the best reef on the island is it is carefully protected from human predation, and the fish are allowed to grow to large sizes. Jan and I have seen large parrotfish, Reef Triggerfish, and trevallys there. If you can, pick a calm, Kona Wind day. Get there when the parking lots open. Use reef-safe sunscreen. Enjoy. Is there any place in Hawaii that has snorkeling for quadriplegics? VERY Different than a paraplegic. Any experience snorkeling on Kauai? I'm paraplegic and also comfortable in the water. I've found Anini beach and am looking for a deep water tour to take me/us out. Any suggestions? Your best option is to come to White Plains Beach on the first Saturday of each month. AccesSurf has literally dozens of volunteers and beach chairs to get you in and out of the water and make it a safe and enjoyable experience for you. Bring your own mask and snorkel. Find them on the internet and sign up for a time slot to get in the water. You'll love it! Sorry, I don't know of snorkeling opportunities on Kauai. I suggest you contact some of the commercial boat tours that take people out to snorkel on the reefs. Also, one of the hotels might have a beach chair you can use, and there maybe a group on the island that does something similar to AccesSurf. Hope you get into Kauai's beautiful waters, soon. Aloha. I would HIGHLY recommend AccesSurf. They assisted my husband, who is paraplegic, but we saw them assist many people with varying levels of ability. Do you know of any good snorkeling on Maui for my paraplegic friend who is coming for a week? 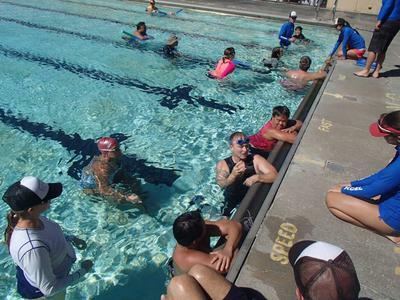 Maui Snorkeling for the Disabled? We are coming to Maui in December. My daughter has MD and loves to swim. She can't do steps or ladders but would love for her to experience snorkeling. Any places that help those who are disabled in Maui? I have psoriatic arthritis. I would encourage people with joint pain to try slightly different methods until you find what is most comfortable for you. For me a "cycling kick" means I can snorkel for 5 or more hours (even if I pay for it the next day!). I use medium-weight fins. Heavy fins produce too much twisting on my knees. On the rare occasions that I swim with my arms I use a modified breaststroke with my arms down about 45 degrees from the water surface. That reduces shoulder stress, for me anyway. Experiment and find what works for you in terms of movements and equipment. Don't give up! 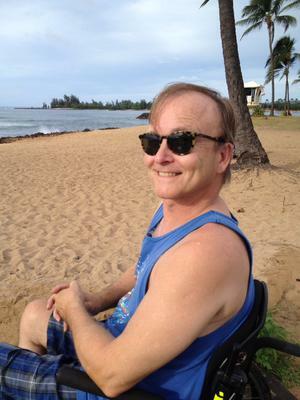 Anini Beach on Kauai has the best access for a wheelchair. The snorkeling was good in 2017 when we visited. Best time is summer, the water is less clear in the fall, and very big waves in winter. I am disabled too and Anini Beach was easy and wonderful. We did not find a deep water tour on Kauai, but there are Fair Wind Cruises on Big Island. I was able to enter and exit water from their boats on two crutches. Highly recommended. Are there any snorkeling recommendations for Kona? I have a friend who is a paraplegic who we can easily carry to the water, but she is also in need of an ADA bathroom at the site. Any info on this would be helpful.